Gazprom reports 2015 gas production cost at $0.84/MMBtu. Gazprom to report the worst 4th quarter of this century. 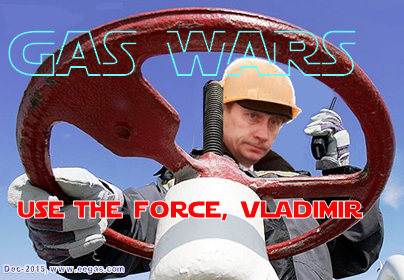 On direct supplies of Russian gas to Eastern Ukraine. Will Russia decide to start gas war with Europe? Q1-2014 gas production cost reported at $1.2/MMBtu, export price at $11.6/MMBtu. Power of Siberia construction cost of Rub 770 Billion. Gazprom reports contradicting conversion coefficients. Gazprom is paying much less taxes than Russian oil producers. Least expensive option to bypass Ukraine was abandoned in 2002. Gazprom gas production cost at $1.2/MMBtu, average export price at $11.9/MMBtu. "Wages of wickedness" in pipeline construction costs of Gazprom. Gazprom may be seriously hurt by the Crimean conflict. Map of major gas pipelines of Russia and Ukraine. Gazprom gas production cost at $1.3/MMBtu, average export price at $11.9/MMBtu. Gazprom raises the South Stream cost to over € 56 Bn. Gazprom reduces pipeline rehabilitation works. Ukrainian gas transit flows 44 percent below the level of 2008. Gas production cost of Gazprom exceeds $41/mcm. Export price reported at $12.6/MMBtu. Putin puts a limit on the growth rate of monopoly tariffs. Nord Stream export route is much more expensive than the old route via Ukraine. Gazprom reports low incremental value of gas transportation assets. Severance tax raises 2012 gas production cost of Gazprom. Does Gazprom threaten war over the Trans-Caspian Gas Pipeline? Buying power plants in the EU may make sense for Gazprom. Gazprom plans to export gas only by its own pipelines. Total cost of South Stream with its feeding pipelines to exceed € 50 Bn. Gazprom wants to have full control over transit pipeline in Eastern and Central Europe. Gazprom reports growing costs at decreasing gas sales. Gas production cost hits the record level of nearly $40/mcm. EU to benefit from Nord Stream extension to the UK. TANAP vs. South Stream - Presentation at TANAP Conference in Istanbul. Gas production cost is up due to severance tax increase. Gazprom is unlikely to fulfill its transit agreement with Eustream. Tenfold increase of the book value of gas transmission assets of Gazprom. Price of gas for Ukraine is not European. It's Romanian. End-use price of natural gas development in the US and Russia. Natural gas is the least taxable hydrocarbon in Russia. Average annul gas production cost of Gazprom is up 20%. Stratfor is incorrect about the dumping price of gas in Russia. Russian and US power plants buy natural gas at the same price. Non-residential price of gas in Russia is very close to the US industrial price. Presidential election, storage capacity and Turkmen gas affected Gazprom exports. Gas production cost of Gazprom is up 38%. Alexey Miller misreports the 2011 performance of Gazprom. Change in the South Stream route gives TAG a chance to stay in business. Alexey Miller overestimates production capacity of Gazprom. Comment on Die Welt interview with Alexander Medvedev. Share of customs duties in the export sales of Gazprom is steadily decreasing. Gas production cost of Gazprom in 2000-2011. Gas production cost of Gazprom in 2000-2010. South Stream, the idée fixe of Gazprom, can be materialized a less expensive way. South Stream puts Trans Austria Gas Pipeline out of business. Sokhranovka-Oktyabrskaya pipeline has nothing to do with the security of supply. South Stream leads to lower exports and higher costs. Gas production cost of Gazprom hits a new record. Russia does spend money on uneconomical pipeline projects. Pipeline project cost estimations of Gazprom get multiplied by a factor of four. South Stream transit in Bulgaria will cost $7.50/mcm per 100 km. Chart illustrating the average gas production cost of Gazprom in 2000-2010. Discounts affect the price of European sales of Gazprom. Gazprom wants South Stream to bypass Bulgaria. Ukraine is back in the game. Gazprom is losing European markets because it prefers staying tough. Gas exports to the former Soviet Union are more profitable than sales to the EU. Nord Stream AG claims the pipeline project cost does not include the finance costs of €1.4 Billion. Who will carry these costs during the construction period? Russian land section of the Nord Stream pipeline is nearly three times more expensive than the OPAL project at the German end Nord Stream. South Stream can result in the loss of exports of Russian gas to Ukraine. Video recording of Gas Session, Russia 2010 Forum, Moscow. Gazprom builds 21-in (530-mm) pipeline at $4.9 million per 1 km. Brokers must be very happy about these spending habits. From 2008 to Q2-2009, gas production cost went up 33% and transmission cost soared 36%. Apparently, Gazprom is unable to control its expenses. In a no-win situation, Gazprom has to chose between laying an empty 1200-km pipe to Germany and building a temporary 510-km pipeline. Gazprom and its partners need to build 11800 km of new pipelines. Gazprom alone has to invest $45 billion. The project will result in multibillion annual losses. Gazprom wants to take a 10% share of the US gas market. Head of "Gazprom Export" thinks there are too many myths about unconventional gas. Gazprom discontinues publication of its segment expenses by quarter. It has been reported in 2002-2008. Combined capacity of Nord Stream and South Stream exceeds the total projected demand for new gas in Europe in 2020 but matches the size of Ukrainian gas transit. Gazprom gets closer to the final solution of the Ukrainian transit problem. Economically, the South Stream project is a complete loss. From Q1-2010, Ukraine will pay for Russian gas the highest price in Europe. Russia's new energy initiative adds elements of central planning to the European gas trade. The average price of European exports of Gazprom in Q4-2008 was well below $500/mcm. Gazprom is ready to reduce profits, Russian government can cut budget revenues to stop the Nabucco project. Gazprom reallocates more costs to the transmission segment and reports unreal trends again. Transit tariff for independent gas is likely to go up. Nord Stream, South Stream hurt Czech energy security? If Gazprom completes the new export pipeline projects, Czech transit can be cut to zero. It puts the supply of Russian gas at risk. Gazprom-Naftogaz transit contract conflicts with the Nord Stream and South Stream projects. Gazprom would need to pay penalties to fill up the South Stream. Naftogaz has no incentives to buy and store gas in summer. 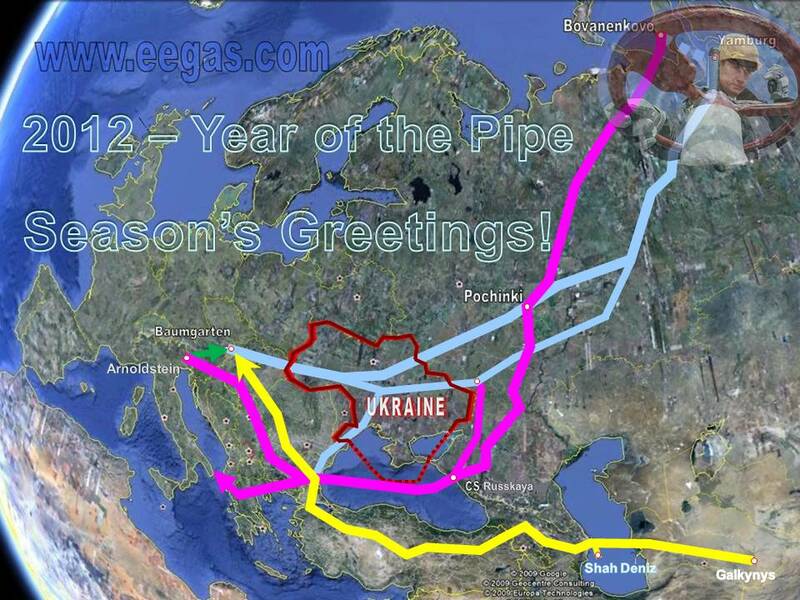 Without Ukrainian storage gas, Europe is at risk of gas shortages next winter. Transit of small volumes of gas via Ukraine is a complicated task. The pipeline chosen by Gazprom is nearly the most difficult option. New export projects can improve the security of supply of gas to Germany and Bulgaria only. Poland will be at risk. In six days, Gazprom lost 86 million cub m out of the total flow of 1436 million. The loss was considered intolerable and Gazprom was ordered to cut off all exports via Ukraine. The export projects of Gazprom are designed to reduce the energy security of some EU member states. 2009 gas sales are expected $30 bn below the record of 2008. Weak ruble to affect the dollar revenue of Gazprom. If Gazprom cuts gas sales to Ukraine, European exports will stay unaffected for the period of 10-14 days. A rational plan can save Gazprom $50-70 bn of pipeline investment cost. The transit cost of gas via Ukraine and Belarus is lower than the transmission cost of Nord Stream and South Stream. Are the South Stream project and Caspian Gas Pipeline abandoned? Gazprom may need the Caspian gas pipeline to compensate for the off-take by the Kazakhstan-China pipeline or to feed the latter pipeline. Putin believes the price of gas in West Siberia should depend on the price of fuel oil in Rotterdam. South Stream is estimated to cost $20 billion. Combined cost of the Caspian pipeline and the South Stream project is twice higher than that of the Trans-Caspian pipeline and Nabucco. Letter to the Financial Times. Gazprom plans to build more pipelines than needed. Comments on the financial statement prepared in accordance with the Russian Accounting Standards. Gazprom plans to increase the capacity of the Northern Lights pipeline by 110 bcm/year creating a capacity bubble 350 km east of the Russian border. The UN Convention of the Law of the Sea gives Ukraine a chance to slow down the South Stream project. Gazprom inaugurates the least important pipeline project. Estonia and Finland are likely to eliminate the international waters in the Gulf of Finland. Alarming reduction of investment into gas production, transmission and storage. Cost of the Nord Stream pipeline is surprisingly high. Profitability of domestic gas sales depends on the accounting method. Brief comparison of Caspian Gas Pipeline and Nabucco project. Comments on the financial results of Gazprom: revenues, expenses by segment, RosUkrEnergo. List of problems complicating the new PR campaign of Gazprom. Belarus may take control over the Yamal-Europe pipeline. November 13, 2006 - Who in Europe will break up the new Standard Gas? July 20, 2006 - Why do shareholders ignore Gazprom's Swiss link? April 6, 2006 - Is Gazprom losing money on domestic sales of gas? Profit or loss of Gazprom depends on the calculation method. Response to Vladimir Putin's letter to the Wall Street Journal. RosUkrEnergo is the only winner, though it is unlikely to stay in business. Due to severe cold in European Russia and miscommunication with NAK Naftogaz of Ukraine, Gazprom exports are likely to drop 15% from contracted levels (file in PDF format). January 4, 2006 - Economics of Russian-Ukrainian Gas Conflict: Who won the war? RosUkrEnergo may be the real winner. Free market in Russia is the loser. Giant leap to centralized economy and a blow to the reputation of Gazprom. Questionable benefits of Gazprom. Deal with Turkmenistan looks like a bluff. The state gains as tax collector, but loses more as shareholder of Gazprom. Gazprom agrees to accept financial loss. Democratic Russia brings the Cold War fears of Europe into reality. Lack of numerical arguments in the gas transit conflict between Russia and Ukraine indicates that it is more a political than economic issue. An increase of price for Ukraine would cause a loss for Gazprom. The Russian state is the only winner. Gazprom saves over $1 billion a year on one side and loses $1 billion on another. More details on the management's inaction to the taxation change of January 2004. Consolidated financial report of Gazprom for 2004 shows declining production expense and marginally increased transmission expense under growing volumes of gas production and sales. Consolidated financial report of Gazprom for 2004 shows declining production and transmission expense under growing volumes of gas production and sales. For the period from January 2004 through May 2005, Gazprom has overpaid $1.3 billion of customs duties. The overpayment is caused by management's inaction on the change of Tax Code. Gazprom continues to lose about $3 million a day of tax overpayment. Charts of gas price through April 2005. Brief review of wage and industrial price indices through February 2005. Summary of changes in taxation of gas business. Effects of gas price increase by Turkmenistan.